“It may be that you are not yourself luminous, but that you are a conductor of light. Some people without possessing genius have a remarkable power of stimulating it.” Sherlock Holmes was right – such is the reality of being a Watson. No, I am not simply talking about Holmes’ friend, Dr. John H. Watson. As Madeleine George explores in her intriguing new play The [Curious Case of the] Watson Intelligence at Playwrights Horizons, many an unexceptional Watson throughout history has borne the innate ability to inspire intellectual strikes of brilliance in others, but it is this ability, coupled with Watson’s faithful friendship and trustworthy nature, that makes Watson truly exceptional. The Watson Intelligence is the overlapping and interrelated story of four Watsons: an IBM Watson-like prototype designed to read emotional cues, a young Dweeb Team computer technician named Joshua Watson, Alexander Graham Bell’s assistant Thomas A. Watson who received the first telephone call, and one-half of the most illustrious crime-fighting literary duo of all time – Dr. John H. Watson. Each of the Watsons interact with two constants – Eliza Merrick and her estranged husband Frank Merrick. The play opens with Eliza programming the artificial intelligence Watson who she treats like a conversational partner and friend despite Watson’s limited emotional and conversational capacity. As their discussion progresses it becomes quite clear that Eliza struggles with interpersonal relationships – Watson is a safe companion that offers the simplest of answers to even her most complicated life questions. Her ex-husband, Frank, is a mediocre man and aspiring city auditor who has apparently spiraled into a pit of despair after his marriage imploded. In an effort to either reclaim or get back at his ex-wife, he hires Joshua Watson to follow Eliza and report on her activities. Unbeknownst to Frank, his actions are the catalyst for a love triangle between Frank, Eliza and Watson that plays out simultaneously in present day and in the 1889 world of Sir Arthur Conan Doyle. As Eliza, Frank and Watson interact in each period in history, Eliza learns more about her own humanity and comes to the realization that, despite all of mankind’s technological advances, real human connection is irreplaceable and incomparable (and sometimes terrifying). The conductor of this luminous revelation? Why, Watson of course. IBM Watson, Joshua Watson and Dr. John H. Watson, while remarkably different, all gain Eliza’s trust and disarm her with their abilities to care unselfishly for her and her well-being (in their own unique ways). However, it is Thomas A. Watson who best explains the curious case of the Watson “intelligence” to Eliza. While the world clamors to hear about Thomas Watson’s role in the invention of the telephone, he is less interested in summarizing the night of the event than he is with recounting the words that Alexander Graham Bell first yelled to him through the telephone: “Mr. Watson – come here – I want you!” The trouble is that history documented different first words: “Mr. Watson – come here – I want to see you!” To the casual listener, the difference is negligible, but to Thomas it is the difference between a man merely summoning an assistant and a man calling out to his trusted confidant and friend in a moment of great need during one of the greatest breakthroughs in telecommunications that the world has ever known. In other words, the difference is deeply personal. Overall Madeleine George’s play is beautiful, but at times it suffers from monologue fatigue. Both Eliza and Frank have their share of revelatory monologues that are engaging and thought-provoking; however, some come precariously close to rants that are just a tad too long. Moreover, the ending feels unfinished. While it is true that the nature of the play does not lend itself to any fulfilling resolution, I left feeling remarkably dissatisfied with the final conversation between Eliza and Frank. Director Leigh Silverman’s staging of the Watson Intelligence is nothing short of brilliant. Never have I seen a production that integrates scene transitions, costume changes, sound design and lighting design to as great effect as in the Watson Intelligence. Scenic Designer Louisa Thompson had the daunting task of creating a set that could fluidly, quickly and frequently move the audience from Victorian London to modern day (and a few points in history in between) – the result was stunning, and I have never been so thrilled to see set changes in action. Mark Barton’s creative and dramatic lighting design left a striking visual impact, and Matt Tierney’s sound design and Peter Stopschinski’s original music were artistically successful and appropriate. In addition to the fantastic technical work, the cast did an admirable job with George’s play. Amanda Quaid’s Eliza has an edgy quality about her. She is complicated and intelligent and self-reliant, but incredibly insecure when it comes to intimacy of any sort. Moreover, I greatly enjoyed Quaid’s nuanced performance as Eliza in each of the different Watson time-periods. David Costabile’s Frank is, for lack of a better word, annoying. However, Frank is a broken man who likes to shout nonsense, so Costabile’s performance is quite fitting really. 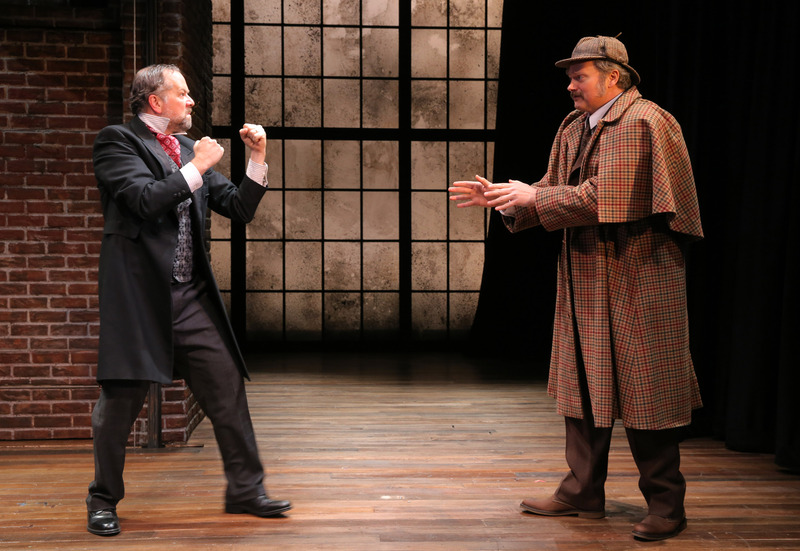 There are times when Costabile’s portrayal gets to be a bit too much (undoubtedly due to the monologue fatigue that I mentioned earlier), but the artful way that he portrays Frank during a key transformation scene from modern day Frank to Sherlock Holmes-era Frank is nothing short of entrancing. Of course, the wizard of transformation in the Watson Intelligence is Watson himself – John Ellison Conlee. Conlee’s four Watsons are remarkably different from one another, yet he jumps between them seamlessly. From clothes, to mannerisms, to speech patterns (and accents!) each Watson is truly unique (except for the mutton chops). Conlee’s performance as IBM Watson is hilarious, and his turn as Dr. John H. Watson made me wish that Sherlock would turn up for a brief examination of Eliza’s case: The Man With The Twisted Plan. While Conlee skillfully portrays IBM Watson and the two older Watsons, he is less convincing as Joshua Watson. Josh speaks and acts like someone in his mid-20s, but Conlee is physically unbelievable as someone that young and there is a visual disconnect that is difficult to reconcile. The [Curious Case of the] Watson Intelligence opened on December 9 at Playwrights Horizons and runs until December 29.